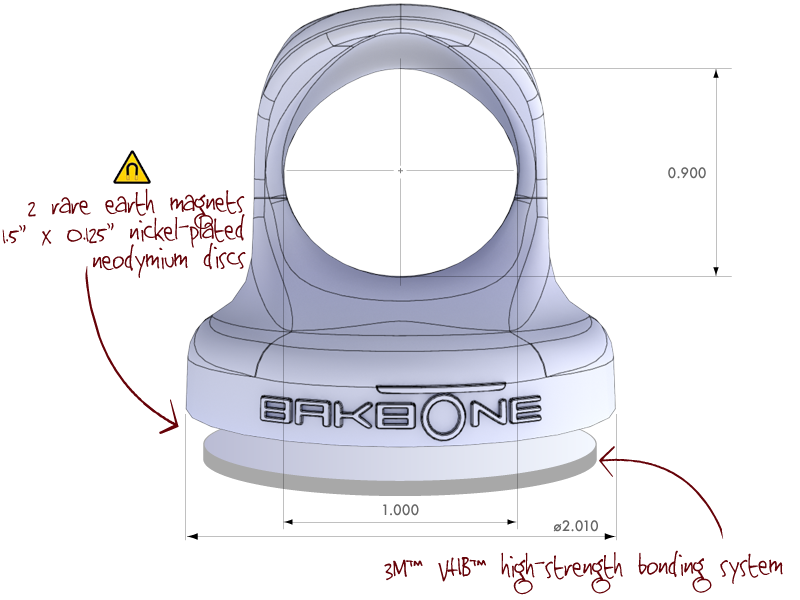 Manufactured in America, the BakBone is an elegant, practical accessory that enhances mobile tablet computing. It securely adheres to the back of a tablet or a hard case or cover by a magnetic system. By simply inserting a finger through the ring or slipping your fingers around the arched side-profile, you can comfortably hold the tablet and smoothly rotate between landscape and portrait perspectives. Its ergonomics alleviate hand fatigue. If de-Boned, the affixed magnetic disc on the back of the tablet presents a minimal profile, so thin that most accessory covers will slide right over it. sanitizers or standard cleaning supplies. The magnet may interfere with input on digital stylus and Wacom-based active stylus technology for products like Microsoft Surface Pro and Samsung Galaxy Note. WILL THE MAGNET AFFECT THE HARD DRIVE OR ELECTRONICS? Our neodymium magnet system is safe for tablets or computers using solid state hard drives [SSD], flash memory, and styli using capacitative or bluetooth technology. If your tablet incorporates an active digitizer layer for precision stylus input (eg. Wacom technology,) like the Microsoft Surface Pro or the Samsung Galaxy Note, the magnets may interfere with the stylus input. Neodymium magnets are the strongest permanent rare earth magnets. Stacking two of them essentially doubles the attraction. Also, magnets can adversely affect credit cards, standard hard disk drives, video tapes, cardiac pacing devices and some older display monitors, to name a few technologies. Please note that normal usage of the Bakbone as per the instructions provided should not come into contact with the aforementioned items. We offer this information as a matter of disclosure. Standard precautions should be attended. BakBone assumes no liability for damages to or aberrant behavior of such devices (or anatomy). For bulk orders, BakBone tablet handles can be imprinted with a logo of your choosing. Please Contact Us for more information. Items must be returned within 30 days of purchase, in "as-new" condition, in original packaging, and with all accessories.